Peaceful fish that can be combined with other peaceful fish. 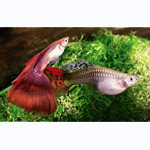 The aquarium should be well planted, and a cover of floating plants is necessary to provide a refuge for young. We all had guppys. The feeding of these fish is easy. Flakes, frozen and live-food are accepted, but some of the diet should be vegetable like algae. Breeding is very easy. They are viviparous. A male constantly tries to mate with the female, so more than one female should be kept. Every 4-6 weeks the female give birth to 20-40 young. They hide between the roots of floating plants. You can feed them with crushed dry food and baby brine shrimp. Guppies have been introduced for mosquito control and have established themselves in local waters in Namibia and South Africa.